Gelastic seizures have been shown to begin in the HH lesion and removing (or otherwise damaging or ablating) the HH can cure seizures. Until recently, HH with epilepsy was considered not treatable, since surgery on the hypothalamus was considered too dangerous. However, several surgical options have been developed that have proven to be quite effective in stopping seizures. In fact, our current understanding of epilepsy associated with HH also argues against excessive delay in surgical treatment, since it appears that some patients undergo a process known as secondary epileptogenesis, in which uncontrolled seizures from the original location can provoke a process by which seizures begin to arise from a second, distant location elsewhere in the brain. When this occurs (a process that is likely to occur over a period of years rather than months) then surgery removing the HH lesion may be less successful for completely controlling seizures. Since 2000, several different treatment approaches for HH have been developed that are recognized as effective and safe. Currently published data suggests that 40% of patients treated with Gamma Knife Radiosurgery (GKR) will be completely free of seizures upon long-term follow-up. Gamma Knife Radiosurgery (GKR) is a relatively non-invasive radiosurgical technique in which a stereotactic frame is temporarily attached to the patient’s head along with a helmet-like device with multiple radiation entry ports. These ports are aligned (targeted) so that multiple beams of radiation are delivered to converge upon the selected target, injuring this tissue, but delivering doses well below the threshold for tissue injury to the rest of the brain. The safety profile for GKR is excellent relative to surgical resection. A small number of patients have transient temperature irregularities following treatment or experience a temporary increase in seizure frequency several weeks after treatment. The biggest disadvantage to GKR is that the therapeutic effect is delayed, typically 6-18 months, but sometimes up to 2-3 years following treatment. Stereotactic Thermoablation (with or without intraoperative MR thermography). Thermoablation involves image-guided stereotactic placement of thin probes into the HH and then heating the lesion to approximately 60°C, injuring the tissue and eradicating its ability to generate seizures. When effective, this therapy works immediately. Multiple passes of the probe into the brain may be required to treat the entire lesion, depending upon its size. Radiofrequency thermoablation can be successful for complete seizure control in up to 71% of patients (32% of these patients required more than one treatment). The safety profile appears favorable in comparison to open surgery, and outcome with pre- and post-operative neuropsychological testing also shows improvement for most patients. Transcallosal Interforniceal Resection. Popularized by Dr. Jeffrey Rosenfeld in Melbourne, Australia, this was the first innovative technique for HH surgery, with an open surgical approach (through a craniotomy) to the HH from above (between the two hemispheres of the brain) rather than below (traversing under the temporal or frontal lobes). Although a longer distance, this approach turns out to be safer and more effective. Open resection procedures are favored in circumstances where the patient is deteriorating, and the delay in treatment effectiveness inherent with gamma knife radiosurgery is not acceptable. Surgical outcome results from two large series have been published with very similar results (complete seizure control in 52% and 54% of patients, respectively). The potential for surgical complications are important to consider: 8% of patients have residual decrease in short term memory function, for example. Transventricular Endoscopic Resection. This approach involves placing a small burr hole in the skull and then passing an operating endoscope into the ventricular system, entering the third ventricle (the fluid-filled space between the right and left halves of the hypothalamus). This approach is ideal for those who require prompt intervention and who have relatively small HH lesions with unilateral attachment to the wall of the hypothalamus. The effectiveness is comparable to the transcallosal resection (49% seizure-free after one year), but the procedure is more easily tolerated with a shorter length of stay in the hospital. Short-term memory is still at-risk however, with 8% of patients experiencing a decline in short-term memory function following endoscopic surgery. 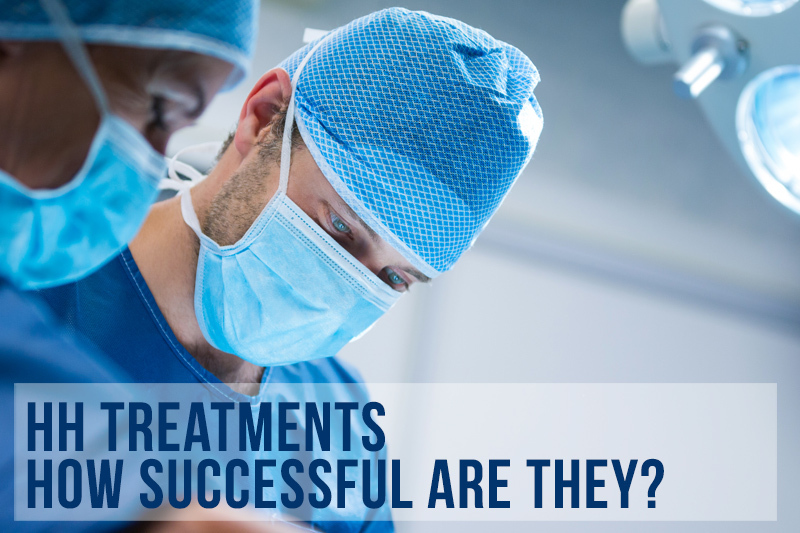 Recent experience is such that stereotactic thermoablation is now the preferred technique for most patients that would have been candidates for endoscopic resection in the past. Focused Ultrasound. This is an investigational non-invasive technique in which multiple highly focused beams of ultrasound energy are brought together at the selected target with destruction of the HH lesion (or other kinds of tumors) with heat energy. If successful, the effectiveness is immediate. This approach is currently under study, and no results have reached publication as of the time of this writing (August 2017). Outcome studies of surgery for HH associated with epilepsy have shown that success in completely controlling seizures is usually achieved in younger patients. Also, a recent research study on HH patients undergoing surgery has shown that a higher likelihood of cognitive improvement after surgery correlates with younger age at the time of surgery. Treatment decisions are highly individualized to the unique circumstances of each patient, including but not limited to; their age, severity and types of seizures, cognitive decline, and even the anatomy of the lesion itself. For those reasons, and many others, an evaluation at a center that specializes in the treatment of HH is highly recommended. Hope for HH would like to thank Dr John Kerrigan for the above information and his dedication to keeping patients and families up to date on treatments for HH.